Every day thousands of families begin the process of getting a mortgage and every day thousands of them are turned down for one reason or another. The mortgage industry has changed in many subtle ways over the last decade or so and although lenders still make money by lending money and charging interest, it has also found a way of making money from the people who do not qualify for finance. Many of these fees and charges are unnecessary or at the very least charged far too early in the process. By understanding what you as a potential borrower is required to do and when can save you lots of dollars and lots of time. For several years I felt an urge, no make that a need, to write a book for my clients. The majority of published books which I have read previously all seemed to be filled with industry jargon which simply confuses the reader. With over three years worth of weekly blog articles under my belt, the time had finally come. 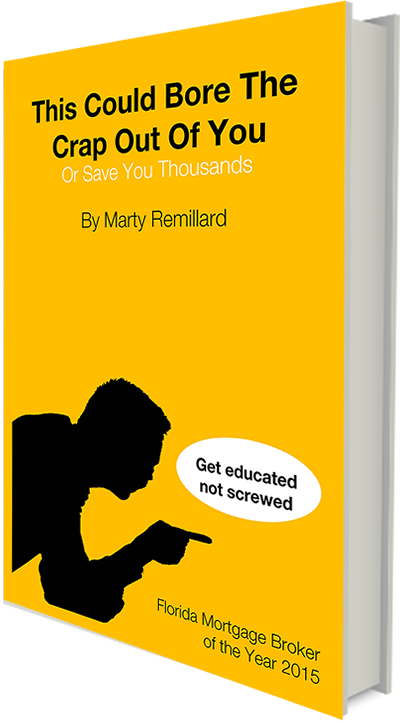 My book ‘This could bore the crap out of you or save you thousands’ has been written in order to explain the mortgage process in the understandable way possible. When I read a book, I read the whole book…so last night I did. WOW this is a great read and helps to make the whole buying process a bit easier to understand. I LOVED the pasta analogy … everybody gets it. The check lists were good too because people have no clue what they need paper wise to get a mortgage. The whole book was entertaining and educational. So if you are preparing to purchase a home, now is a great time to learn what to expect and how the whole procedure works. A couple of hours today can save you weeks of sleepless nights and quite possibly several thousand dollars.